Vitamin D is a special vitamin because the body can make it when the skin is exposed to UVB rays from the sun. Vitamin D is required by the body to absorb the mineral calcium from the diet. After absorbing calcium from the intestines, the body also needs vitamin D to help it maintain normal levels of calcium in the blood. The body also uses vitamin D when it is making new bones from the absorbed calcium. This nutrient is also required in the healing process in which bones are remodeled after fractures. Vitamin D is also used together with calcium to help bones with osteoporosis heal. This nutrient has also been shown to reduce the risk of developing colon cancer. Foods that have been fortified with vitamin D are other great sources of this nutrient. Examples include orange juice, milk, magarineand cereals. Cod liver oil is another excellent source of vitamin D.
Basking in the sun for around 10 minutes twice a week with the arms and legs exposed is another way a person can increase vitamin D levels in their body. The recommended dietary allowance (RDA) for vitamin D is 600 IU (15 mcg) for both men and women aged between 18 and 70 years. This RDA for vitamin D can be obtained by eating 400 grams of tofu or 114 grams of trout. All persons aged more than 70 years are required to take 800 IU (20 mcg) of this nutrient each day. 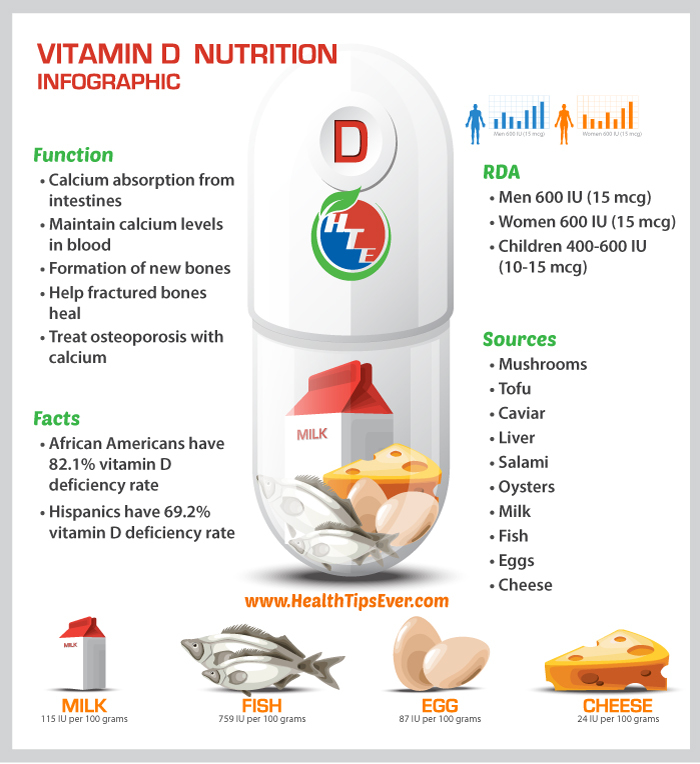 A study found that the prevalence rate of vitamin D deficiency in the United States was 41.6% with African Americans having the highest rate of 82.1%. Hispanics had the second highest rate of 69.2%. Rickets is one of the diseases caused by Vitamin D deficiency in children. This condition is characterized by poorly mineralized bones which cannot bear the child’s weight. As a result, the soft bones bend and form bow legs and knock knees. Vitamin D deficiency in adults causes osteomalacia. Symptoms of this condition include painful bones which break easily due to the defective mineralization that is caused by a lack of this vitamin. Vitamin D deficiency also aggravates osteoporosis. This is a condition that affects postmenopausal woman and causes weak bones that fracture very easily. Vitamin D is required by the body to absorb calcium from the diet and to use it to make healthy bones. Foods that are good sources of this vital vitamin should therefore be consumed every day to prevent rickets and other diseases linked to vitamin D deficiency.